Hola todos, happy transfers! Transfer boards are fresh out of the oven and just got the news that I'm staying here another 6 weeks in St. Peter with Elder Christiansen! I’m definitely looking forward to this next six weeks. We have high hopes! This week was a good week! Unfortunately, not super eventful. But we're still on that mission grind! We were cutting close to our mileage allotment for the month so we mostly worked here in St. Peter. We had some fun biking in the rain lol. Overall, it was good. We had a mission-wide finding hour this week. So, we set a time that every companionship in the whole mission would spend a full hour out either contacting or knocking on doors trying to find new people to teach. We had a few really awesome contacts with people, one of which is a Minnesota State college student from Vietnam named Dawn. We had a really nice conversation with her and we testified of the perfect love our Heavenly Father has for each of us. We were able to teach her most of the restoration at her doorstep, and she was super nice and was interested in us coming back! We got her number, so hopefully we can set something up with her after finals. 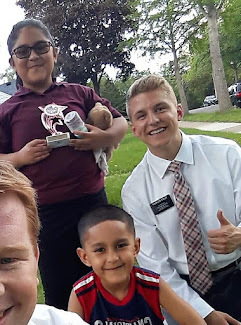 It was such a neat experience knowing that every single missionary in the mission was out knocking doors and sharing the gospel at the same time! There's a member of our church who lives south of us in a town called Mapleton who has a famous hot sauce called "Cherry Sauce." It's crazy hot! It's not peppers, but condensed cherries that make it so tart it causes it to be spicy. It’s similar to ice being so cold it can burn you. Just to give some perspective, a ghost pepper is about 1 million Scoville units, one of the hottest peppers in the world - the Carolina Reeper - is roughly 4 million Scoville units, and one drop of this sauce is 14 million Scoville units!! So, of course, my mission wouldn't be complete if I didn't try it at least once😂. Elder Christiansen and I just about DIED hahaha. But, ¡Vale la Pena! On Wednesday, we had a super awesome opportunity to help teach part of the mission prep class for our stake with the Mankato elders. It was a really awesome experience. we have some super solid youth in our ward! Makes me wish I would have started having a pattern of daily scripture study and prayer earlier in my life, because now I realize the power and importance of these fundamental testimony-building habits! We also got a few of the priests to come out to ward soccer on Saturday and meet some of the non-member MSU students who also play with us. I'm definitely a lot better with my hands than my feet, but I've noticed the more Spanish I have been learning the better I become at fútbol. Maybe there's a correlation there? Haha jk. But I am really starting to love it! We also had an amazing zone conference on Tuesday all the way up in Lakeville. It was awesome to see all the missionaries in our zone, and it's crazy big, we have so many elders in our zone haha! We were able to see one of our progressing investigators Germán this week, and he's like one of our only Spanish speaking investigators so it's always nice to meet with him and practice some Español haha. He is still progressing well, it's been difficult to get him to church, however, because he works on farm and has work on Sundays. We had a great lesson with him yesterday about the importance of keeping the Sabbath day holy and partaking of the sacrament at church! He said he will talk to his boss about starting to switch his work schedule, so hopefully he can come more often!! I'm so grateful for the chance we have every Sunday to give our time to worship the Lord and be spiritually nourished at church. There's such a powerful spirit there every time! I know that as we go to church every week, and partake of the sacrament, we can have the Holy Ghost with us always and be strengthened to endure the struggles of this life. I testify that Jesus Christ is our savior and redeemer. It is through him that we can take the sacrament and be forgiven of our sins! I love you all and hope you have a fantastic week! Aftermath of the Cherry Sauce Test!